Maria Zwar was born on 2nd August 1858, the first child of Johann and Magdalena Zwar. Her marriage certificate in Melbourne gives ‘Kleine, Saxony’ as her birthplace, but a detailed map of this area of Saxony shows no village by that name. She may have been born at her grandmother’s home? Her parents were living at Drehsa. A brother was born in Saxony but he did not live. Maria was the first child of Johann and Magdalena Zwar nee Schmaal and the only Zwar to emigrate to Australia as a child. Her parents Johann and Magdalena Zwar, her uncles Michael and Peter Zwar, and her cousin Ernst Zwar all went to Australia as adults. Two weeks after her third birthday Maria Zwar and her parents left their home in Saxony and would never return. On Saturday afternoon 16th August 1851 they boarded the train at Bautzen along with about 90 other Wends who were also emigrating to Australia. Maria’s mother was some months pregnant. Her father was leader of the Wendish Group, the largest to emigrate to Australia, and he was kept busy with travel arrangements and train tickets. It was a delay with getting tickets at Dresden that led to them missing the train and they stayed overnight in the Dresden railway station. After their evening meal they sang Wendish hymns, and the singing attracted a number of people. The next morning they were up early to catch the 5 am train to Leipzig. In the afternoon they spent several hours in Magdeburg and then travelled on to the city of Wittenberg. After dark they had to cross the Elbe River on a Steamer, and this was a scary experience for some of the travellers. They were up early again the following morning to catch the 6 am train from Wittenberg to Hamburg. Their ship was waiting for them in Hamburg and intended sailing in two days. However a group of Germans from Silesia who were to travel with them had not arrived so they changed plans and prepared to travel on a smaller ship called the ‘Helena’. It would be her maiden voyage. While they waited for the ship to be loaded they stayed in the guest house ‘Stadt Neuyork’ where they enjoyed the spacious rooms and good meals. Maria’s father was kept busy sorting out loading arrangements as the emigrants had brought lots more luggage than expected. Some of the large and heavy boxes had to be loaded and unloaded three times before everyone was satisfied. There was still more luggage and some had to be left behind to go to Australia by another ship at a later date. On Saturday 23rd, a week after they had left home, the ‘Helena’ sailed up the estuary to Glueckstadt where they were delayed by wild weather. After eight days they tried to sail but had to turn back after several hours. On September 3rd they managed to sail to Cuxhaven. They following day they sailed out onto the ocean. It was a strange experience for the emigrants to look out and see nothing but the sea in all directions. The parents pointed out France and England to the children as they made their way through the English Channel. Many of the adults were soon seasick. At first the children were not so affected, but later on when the children became ill it was far more serious and some of them died. One can only guess at the effect this would have on Maria. Little Marga Mirtschin died on 14th October. Her body was wrapped in white linen and tied to a board. Everyone attended the service, held in both the Wendish and German languages, including several hymns and a spiritual address by Peter Döcke. The captain went forward, removed his cap and offered a prayer. Two sailors slowly lowered the body into the ocean. Twelve days later three year old Andreas Mirtschin followed his sister. Thirteen days later it was the turn of Andreas Ponich, only three months old. The Zwars were close friends of the Ponich family. The voyage was an education in many ways. The passengers enjoyed watching the sharks, dolphins and flying fish, and particularly the whales. A shout would go up when whales were spotted and everyone would rush up on deck to get a good view. Someone caught an albatross and they tied a little board to its neck with the words “The ship ‘Helene’ of Hamburg” before letting it fly away. Their ship went through a number of storms. By November 27th they were so far south towards the Antarctica it began to snow and those without warm clothes suffered from the cold. The same evening a fierce gale blew up and they feared it would smash everything to pieces. People called out to God for mercy. “At 6 am we were together in bed drinking coffee when a huge wave suddenly hurled itself over the ship, covered the deck and rushed between decks. It also entered my cabin so that little Maria, who was still asleep, was completely covered with water. I lifted her up but I and my wife found ourselves sitting in water. There was a considerable amount of water between decks, and boxes, cups, boots and other things were floating around everywhere. … We had to change into new, dry clothes but every bed and pillow was soaked and all the while the hour of birth was drawing nearer. But God that very day sent warm weather so that the beds all dried. That afternoon my wife gave birth to a son and that without the doctor assisting. The captain and all others were happy about this event and congratulated me, particularly since they had feared that the anxiety experienced may have affected my wife adversely. Maria’s baby brother was buried at sea the same way as the other children who had died on the journey. His little body was wrapped in white cloth, tied to a piece of wood, and gently lowered into the sea during the service. A sailor lifted Maria up so she could see the body as it slid into the water. This image stayed with Maria for the rest of her life. Port Adelaide The Helene arrived at Port Adelaide in South Australia on Christmas Eve, 1851. The Zwars had intended going on to Melbourne, where they would be close to Johann’s younger brother Michael Zwar who had arrived in Melbourne several years earlier. However a number of Wends who had settled at Rosedale near Adelaide several years earlier called on the newly arrived group. There was much excitement as some were old friends and even relatives. The local Wends needed help with their harvest and suggested the new arrivals could join them for a while and then still go on to Melbourne, nearly a thousand kilometres further on at a later date if they still wanted to go there. The Zwar group of Wends rented a house in Port Adelaide to store their goods while they went to Rosedale to help with the harvest. One of the Rosedale children was Christian August Petschel, six years old. Maybe he hardly noticed the three year old Maria Zwar. The irony is that some of the Rosedale families, including little August Petschel, sold up and trekked overland to Victoria some months later, together with four of the families who had been in the Zwar Group, but Johann Zwar and most of his group stayed in South Australia. Maria Zwar stayed in South Australia because of the Rosedale Wends. Eighteen years later she would go to Victoria to marry August Petschel who had trekked overland to settle at South Hamilton, and she would spend the rest of her life in Victoria. Maria Zwar stayed in South Australia where her parents, along with other Wends, were founders of a new settlement they called ‘Ebenezer’. One source [p. 56 ‘Barossan Foundations’ …Elfrida Jensen] says they arrived there before New Years Day 1852, only a week after their ship had landed at Port Adelaide], but the paragraph has a number of quite inaccurate pieces of information. The district that would become known as Ebenezer was in the Barossa Valley where a good number of Germans and a some Wends had been pioneering new villages and farms for about ten years. Langmeil and Tanunda were the first villages. Ebenezer never became a town, but developed as a farming area with the Lutheran Church, school and cemetery as the centre of the community. It was one of the few Wendish settlements in Australia’s history. For Maria it was a primitive beginning in her new land. She was a three year old in the crudest of pioneering days where the first families went into virgin bushland and made a home and a living. In their humble ‘home’ the family had Wendish devotions and prayers in the morning and in the evening. Their first home was built out of wood and pug in 1852. Maria’s father also worked at clearing and farming the land. Maria told her grand children how she helped spread the grain by hand from a bag hanging in front from her shoulder. Maria’s sister Anna Zwar was born on 13th January 1853. At this stage Maria only spoke Wendish. When she heard German spoken she did not understand it and she said it sounded like geese chattering to her! When she was six years old Maria’s uncle Peter Zwar arrived from Saxony with his bride Lena and the honeymoon couple lived with his brother Johann Zwar until settling on a small farm nearby. Uncle Peter was a carpenter and spent time building houses in the district until he had enough money to buy his own farm. He did the carpentry work on the first Lutheran Church buit at Ebenezer. A sister, Christiane, arrived but she soon died. On 22nd October 1856 another sister arrived for Maria Zwar and they also called this one Christiane. In her life story Maria says that she first attended the Wendish school and later the German school at Ebenezer. This seems to be the only evidence of a Wendish school in Australia. There may have been others but there is no record. The year Maria Zwar turned ten the pioneers built a proper though humble school at Ebenezer. On Sundays it was used as the Church. It is likely the German language was introduced with the opening of the new school. Maria now had to learn German. Later in her life Maria would always insist that her children and grand children use the German language. Early in 1859 the first Ebenezer Church was dedicated. It had a thatched roof. Maria’s uncle Peter did the carpentry work and carved his initials on some of the main timbers, as was his custom. Maria’s mother had never been a strong woman and now her health began to fail. Her mother Magdalena Zwar had developed tuberculosis and it became apparent she would not recover. Magdalena’s main concern was for her three daughters, Maria, the oldest and only eleven years old, Anna, six years old, and Christiane nearly three years old. Magdalena prayed she would live to see Christiane reach her third birthday. Magdalena shared her concerns for the future of her children with her husband Johann, and advised him to marry again after her death so the children would be properly cared for. Magdalena even suggested several likely women. Johann secretly hoped he might find work in the Lutheran Church somewhere so he could care for the children himself. Maria’s mother died on October 22nd 1859, aged 40 years. It was Christiane’s third birthday. Maria was eleven years old and Anna was six. Life became an ongoing battle for the family. Maria kept going to school. Her seven year old sister Anna should have been attending school too, but she had to stay at home so she could look after little Christiane during the day while their father was out working the farm. It was a battle to survive. 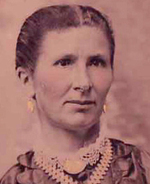 In 1862 Maria Zwar was confirmed by Pastor Staudenmeier at Light Pass. On April 6th 1863 Johann Zwar married Anna Kaiser in Melbourne. Johann had gone to Melbourne the previous year to look at the possibility of doing mission work for the Lutheran Church there and he had stayed with Anna’s brother Andreas Kaiser for a few weeks. After he returned to South Australia Johann wrote to Anna and after a series of letters they decided to marry. Maria probably did not remember Anna, but Anna Kaiser also came from the same village of Drehsa in Saxony, and had even been a guest at Johann’s first marriage, to Maria’s mother. Maria was nearly 15 years old when her father arrived home from Melbourne with her step-mother. Her father Johann and step-mother Anna did everything they could to try and help the children adjust to life with their step mother. Anna had herself experienced a step-mother as a teenager and she and her sisters had problems, especially when the step children began to arrive. It was probably a main reason Anna’s 15 year old sister had left home and gone to Australia. So Anna Zwar was aware of the problems and tried her best to be a mother to her three step-daughters. Then the first of seven children arrived. Johannes arrived early in 1864, followed the next year by Salome. The relationship between Maria and her step-mother Anna deteriorated. Maria resented her step mother. They arranged for Maria to go to Melbourne in 1856 where she stayed with Andreas Kaiser, Anna’s brother and his family. Maria enjoyed her time there, and made another visit to Melbourne the following year in 1867. In 1869 Maria Zwar made another journey to Melbourne to marry Christian August Petschel. It was an arranged marriage, but who actually arranged it is not clear. The Petschel’s were also Wends. They were known to the Zwars and the Kaisers. For a time they had lived at Rosedale in South Australia and were one of those who talked Johann Zwar and his group of Wends to stay in South Australia. Then the Petschel’s moved to the Hamilton District in Victoria, about 400 kilometres west of Melbourne. Their farm was on the road between Tarrington [Hochkirch] and Hamilton. It may have been Andrew Kaiser and his wife who made the arrangements for the marriage, with the consent of Maria’s father Johann Zwar. Maria Zwar and Christian August Petschel officially met for the first time in the Kaiser’s home in Hawthorn three days before their marriage. They had written to each other for some time. They were married in the Lutheran Church in Melbourne by Pastor Hermann Herlitz on the thirteenth of July 1869. Maria was 20 years old and Christian 27. Maria’s uncle Michael Zwar signed the marriage certificate as a witness to the marriage. He lived about 50 Kilometres north of Melbourne. “I, Andrew Kaiser of Hawthorn, being the Guardian of Maria Zwar in this Colony, hereby give my consent to her intermarrying with Christian August Petschel, Farmer, of South Hamilton. Apparently Maria’s father had not attended the marriage. It was 800 kilometres away and he had a wife and little children to care for at Ebenezer. The story was often told, when August Petschel and his new wife Maria nee Zwar were traveling by horse and wagon to South Hamilton after their wedding Maria was still addressing her husband as ‘Mr Petschel’. She was a very polite young lady and always insisted on correct manners. Christian gently suggested that his friends and relatives might think it strange if his wife called him ‘Mr Petschel” and suggested she call him ‘August’. Like Maria, August Petschel had also travelled to Australia from Saxony as a child. August Petschel was born at Neukirch in Saxony on 13th January 1842 on his parents’ farm. He emigrated to Australia with his parents in 1848 when he was only six years old. August also had an older brother and sister. In later years his sister Christiane wrote quite a detailed account of their journey across the oceans and the early pioneering years in Australia. She was two years older than August. Two uncles, younger brothers of their father also made the trip. There were revolutions in a number of areas in Europe, including one in Dresden less than forty kilometres from the Petschel farm. It seemed as though there would be war and the young Petschel brothers would be called up to fight in the army. Their father encouraged them to go to Australia with their older brother and his family. “Then came the last Sunday when all the relatives assembled to bid us farewell and partake of a final cup of coffee and kuchen [German cake]. Many tears were shed, as it meant parting, never to see each other again.” [..from his sister Christiane’s account]. “On Monday, August 3rd at 9 am we were conveyed to the railway station in a farm wagon accompanied by grandfather. In Berlin we were forced to stay the night where everywhere traces of the recent revolution could be seen and which caused us great anxiety so that we were glad to continue our journey next morning hale and hearty. The same day at 4 pm we arrived at Hamburg and soon found our lodgings where we stayed till the 13th August. Up to this time all the families stayed together. We all occupied one large room, sleeping in our clothes on a floor covered with straw. The Alfred was a large ship and carried 300 emigrants. In the first days the people became seasick. “We had pickled pork and corned beef alternately on the whole voyage. Shortly after breakfast each day a barrel of meat was opened and a call of “Meat” was sounded over the whole ship. The occupants of each double cabin received a piece of meat weighing two to three pounds. This was washed in seawater, all objectionable parts having been cut off and a small round tin disc bearing the number of the cabin was fastened to each piece and handed over to the cook. Vegetables consisted of Monday – peas. Tuesday – pearl barley. Wednesday – sauerkraut with half a potato for each person. Thursday – lentils. Friday – beans. Saturday – rice. Sunday – pudding. “The captain, by the name of Decker, was a pleasant and friendly man, he was accompanied by his brother, later we heard that both had settled down in Adelaide. As we neared Australia, the captain gave us the choice of landing at either Adelaide or Melbourne, and we decided on Adelaide, reaching that port about Christmas. We were surprised to see how bare everything looked with only two or three small ships at anchor. At low tide these ships leant over to such a degree that one wondered that people could walk on deck. When our good ship “Alfred” anchored, we had to make arrangements to go ashore. Before we left we arranged to have a farewell dinner, which consisted of fresh mutton, fresh vegetables, and fresh bread, and you have no idea how this was enjoyed by one and all after partaking of stale food for four months. The next day we decided to land but can you imagine how. Everyone had to climb down the ship’s rope ladder assisted by a sailor. I personally felt very scared but we all managed to get into the boat safely. Arriving in the dark, shortly before midnight, we had no idea of our surroundings. The men had all stayed on the ship waiting to see our cases unloaded, which took a long time, so that it was over a week till they turned up, and here we woman and children all alone in a strange country among strange people. “We felt very relieved when after 5 or 6 days wagons arrived and took us to Langmeil, Tanunda, a distance of about 40 miles. Father and the other men were still away seeing to the unloading of our cases. “There was absolutely nothing on the place, not even a hut; but, with our goods we were simply dumped down and the wagons drove off. Nearby there was a creek, called Sandy Creek. After a general discussion, it was decided to call our settlement “Rosenthal”. “Naturally we could not live in the open, so the first thing was to build a house. Father and his two brothers took axes and saws and went into the bush for building material, which was not an easy task as suitable wood was scarce. When eventually they found a suitable tree it would be felled, trimmed and sawn so that it would be as light as possible for it to be carried home on their shoulders. This was firmly rammed into the ground and they would set off to search for another suitable tree, and so on till sufficient timber was obtained. When the framework of the roof was finished the problem was how to cover it. Not so very distant there was an old settlement called “Hoffnungsthal”, and all of the settlers offered father straw for the roof, if he would thrash it. This had to be done with a flail. This kind offer was certainly worth considering, so the three brothers each made themselves a flail and off they went, leaving us again on our own. In a few days they reckoned they had sufficient. In the meantime father had purchased a wagon and two bullocks, so they loaded up the straw, brought it home and at once started thatching the roof, but alas, it barely covered half the roof so they had to go back and do enough thrashing to finish the roof. We at once occupied the house although it looked more like a birdcage as it was without doors and windows. Now came the job of pugging the walls. Water was to be had not far away, so father made a sledge out of an old tree, fastened a barrel on it and harnessed our bullocks to it; in this way the water was brought to the spot. “I must mention that the other families that left Germany with us had similar experiences… We purchased several goats which provided us with the necessary milk, but these were soon disposed of, as we found them too thievish, causing us great worry. Then father bought two cows, but as we had no paddock for them they would stray away from the place and eventually could not be found. After several months one was found but she had learnt to crawl through every fence and got into the wheat crop. That was no good so she had to be slaughtered. Scarcely had our neighbours noticed that father understood the killing of a beast, he was made slaughter man for the whole community. “Whenever a ship with new settlers arrived at Adelaide, it was customary for each householder to meet the ship with his wagon. Each settler would then bring back one or two families who later would help us to reap our harvest with sickles and as payment the respective families would be provided for. At this stage I would make a remark about our harvest and that is that for our very first crop, father managed to get a handful of wheat which was carefully sown and tended and when ripe, cut down with a pair of scissors – this provided us with seed for the following year’s harvest. “Quite a number of families came from Madgeburg. My parents and several others did not feel at home with these new settlers, so they discussed amongst themselves the idea of leaving the settlement. There were several reasons for this, firstly, on account of the heat which made the water brackish, and secondly as regards land, which was good for ordinary cultivation, but not suitable for vegetables, so that most of the year we were without vegetables. One of our party corresponded with a friend in Melbourne, who had written that they had lovely soil for vegetables, and the heat was not so severe. We therefore decided to send a man to investigate. “When our friend returned his report caused a great sensation. Now we discussed in detail the best way to get to Portland with our belongings. We already possessed implements for cultivating the land, as well as livestock, the latter we naturally wanted to take with us. But how could this be done? We were informed that there was a great desert of 400 miles between South Australia and Portland. It was decided to send two of our party, accompanied by a Mr. Blandowski – who was a good bushman – to explore the overland route and especially where to find water, where we could camp at night, as we intended traveling in the Autumn. In a few weeks they returned with a good report. They had found a beaten track which at times was only a narrow path, by following this track we could not go wrong. “To provide sleeping accommodation as well as shelter from rain we built hoods over the wagons. Chaff had to be taken for horse feed, also a bag of flour, on top of these was our bedding. Across the front of the wagon was the tucker bin, which served as a seat and at the rear of the wagon a coop was fastened containing the poultry. Our herd of 52 cattle was driven by two of the party. For the conveyance of the eight families, we had eleven wagons, two of the party and father owning two wagons, eight of which were drawn by horses and three by bullocks. And so, in God’s name, we started by journey to our new home, leaving Rosenthal early in May 1852. “Immediately we stopped to camp, we children would gather wood for the fire. Every evening a big fire was lit so as to give us coals for baking bread. As soon as there were sufficient coals each mother came and raked the coals into a circle and deposited her camp oven containing the dough therein, in the circle and placed some coals on top of the lid of the oven and in about an hour’s time the bread for the next day would be done. Dough was usually prepared in the morning, kneaded again at midday and so it was ready for baking in the evening. Throughout the whole journey our meals consisted of bread and butter and tea without milk. Everybody was happy and contented and what was more important everyone was well during our journey. The owner of one wagon had eight children, of which the older ones had to sleep in the open. God blessed us with fine weather, except one night when it rained, causing those sleeping in the open many tears, as their feather beds got saturated. It seems they made some money selling eggs from their poultry and milk, butter and cream from their cows. Applications to the government for land to be put on the market in the area proved fruitless. The Lutheran Pastor, Clamor Schurmann arrived and his family shared a house with another family in Henty. Pastor Schurmann wrote letters to the government as he was fluent in English, but no land became available. These were the gold rush days and the government had difficulty keeping people in the public service. Land did not become available for months and then speculators bid prices far too high for the Wends to compete with. “Because of the high prices only three, Wilhelm Petschel, Johann Hundrack and Michael Deutscher, purchased properties. Altogether they purchased a total of 230 acres for which they had to pay the ‘enormous’ sum of £1,359/17/–, the lowest price being £4/4/– and the highest £8/12/– per acre. “Once again we had to start on virgin soil, as at Rosenthal. This time it was not so difficult as we had gained much experience and brought many things with us. We had now found that we could live quite comfortably in a tent for the time being, until we had time and material to build a house. Father erected a tent in no time with a pugged chimney, and a frame covered with calico for a door. In this tent we lived for about a year, it being quite comfortable even in stormy weather. We were surrounded by squatters, the bleating of their sheep and lambs sounded in our ears day and night, so that we did not feel lonely. Pastor Schurmann arrived from Portland to look after the Lutherans in the area. No doubt Christian August Petschel, now eleven years old, was also one of the students. It may have been his first school. His older sister says that she had only had a few months of school prior to this. However their experiences from life over the past five years since leaving their home in Saxony had equipped them well for the years ahead. The farmers did well. In the next ten years dozens more Germans and Wends arrived and settled in the District. There was soon a serious dispute with Dr Loessel and one of the elders locked him out of the Church. A number of followers left with the pastor and they built another church in Hamilton. After eighteen months this congregation folded. Some of the members went back to Pastor Schurmann and others left the Lutheran Church altogether. Meanwhile the St Luke’s congregation looked for another Lutheran pastor and in 1865 Pastor C G Hiller arrived. This was an important event for the congregation as he stayed for many years, but even more importantly for the Petschel family as the new pastor married Christiane Petschel, the sister of the Christian August Petschel who married Maria Zwar. Although Maria Zwar and August Petschel’s marriage was an arranged one it seems to have worked out particularly well. The two were opposites in character and complemented each other. Maria was prim and proper, immaculately groomed, strict and a strong character. August was relaxed, casual, warm and loveable. They lived at South Hamilton. Over 100 years later a pile of stones lying near a fruit tree in a paddock a little way in from the main road was all that remained of their house which stood near ‘breakneck corner’ between Tarrington and Hamilton. August Petschel was very skilled with his hands. It seems he could build anything. It was said he was only 15 years old when he built an organ (probably a reed organ). August was a gifted musician and would often play the organ for Church services. In time August built two German wagons, built his own buggy and made his own harness. Maria was busy too. Three children arrived in three years. Their first child Clara Amalia Petschel was born on 9th August 1870. Then came Christian Bernhardt [Ben] Petschel, born 22nd October 1871. August Edward Petschel was born 29th January 1873. They called him Edward. In 1873 new land was being surveyed and opened up for settlement in the Wimmera District about 200 kilometres north of Hamilton. August Petschel took out a lease on allotment 102 containing 320 acres of land on 22nd August 1873. It was part of the lease agreement that a number of improvements equivalent to one pound per acre had to be made to the property in the first year or the lease would be forfeited. August was an experienced pioneer. He left Maria (pregnant) and their two children in South Hamilton and went north and camped on his lease, built a shack to live in, and started fencing and clearing the property. Then August went back to South Hamilton, and Maria and the three children moved north with him with 2 wagons and horses and arrived on the property at Wail on 2nd May 1874. August was 32 years old and Maria 25. August officially became a naturalised citizen on 1st May. One had to be a naturalised British subject to own land. The Petschels had been among the first pioneers to clear the virgin bush at Rosedale. Then they trekked overland about 600 kilometres and pioneered the land at South Hamilton. Now August Petschel started again for the third and last time. August bought a winnower and added a horse treader to it which he designed and built himself. The horse would drive the winnower by walking on the one spot on the treader. It was so successful August did a lot of contract wheat cleaning in the District. Sometimes the pioneering life was tough for Maria. One day when Maria had little children to look after, August left home to go and search for a horse that was missing. He was away for days and Maria feared the worst. She was quite anxious and uptight by the time August arrived home. She rebuked him for being away so long, and he said, “Woman, haven’t you got faith in God?” And she went to bed and cried. Their son Nathaniel Otto Petschel arrived 17th October 1876. They called him Otto. There are two photos taken about 1877. One shows the first house at Wail with Maria and August out the front of the house, with three of their children standing and the baby Otto in the pusher. The other photo shows the first shed they built. August took out a mortgage on allotment 102 on 14th July 1876 and paid it off to the Oriental Bank Corporation on 24th July 1880. On February 3rd 1879 he bought allotment 21 of 220 acres from Patrick Lynch for £2-10-0 per acre. It was just over the road and due east from their homestead. August paid in cash. Their fifth child, Christian August Petschel [Gus?] was born in Dimboola on January 1st 1880 and baptised in St Johns Lutheran Church Dimboola by his uncle, Pastor Hiller. [Pastor Hiller had married the sister of Christian August Petschel when they lived in South Hamilton. So many families moved north from the Hamilton District to the Wimmera that Pastor Hiller and his wife Christiane moved there too. They lived in the Lutheran manse in Murtoa.] The Petschel’s were staunch supporters of the Lutheran Church. August would go to Synods to represent his congregation. Maria and August were foundation members of St John’s Lutheran Church in Wail (1876). The Petschel farm prospered. It was rich agricultural soil ideal for cereal cropping. In 1903 Amalia wrote that the crop of oats in a small paddock at Katyil was seven feet high. In 1898 Otto married Auguste Stoessel. He was heartbroken when she died after giving birth to their first child. In later years everyone called Maria ‘Granny’ Petschel. She lived to be nearly 90 years old and many of her grandchildren were married before she died and got to know her well. The following includes memories from some of the grandchildren. Granny always insisted her children and grandchildren speak to her in German. They were not allowed to read books written in English, but only German books. One recalled that Granny had no time for Englishmen and Aborigines! This attitude was passed down. Lena Smith, a grand daughter, married an Englishman and was not allowed a wedding reception. Sometimes when Granny carried on about ‘German’ one of her children would remind her that she was really only a Wend herself and this would get her angry! Alf said that Granny blamed the British for anything that went wrong in the world. As a result he rebelled and became pro British. Lena recalled that Granny had a marvellous complexion. “She never had a wrinkle on her face.” When she was about 18 years old Lena made a trip to South Australia with Granny to visit the relatives. In some ways Maria was remembered by her grand children as very strict. Clara Petschel remembered her granny as stern and bigoted, ‘she spits fire out of her eyes’. She could also remember her granny reading a poem to her in Wendish. Granny often spoke Wendish to Tot Petschel, and taught Tot the Wendish words for a number of things. Granny’s birthday was always a party for the grand children – the day of the year. “Grossmumma’s Geburtztag”. She always liked to be called ‘Grossmumma’ and not ‘Grossmutter’.” Lena Smith said that it was so wet one year on Granny’s birthday they had to walk the 14 miles to visit her as it was too wet to drive, and ‘Granny was delighted’. August Petschel was an amateur photographer. He processed the films and printed the photos himself. As a result there are numerous photos of Granny with each of her children and grandchildren, taken at various times like birthdays and confirmations. They sent copies to the relatives in South Australia. Maria could not get to South Australia for family events like the marriages of her many relatives. They would send her photos and her daughter Amalia would mount them in a book and neatly write in their names. It is probably the best collection in Australia of Zwar photos from the early generations. The collection was passed down through the Starrick family. The following incident gives an insight into Granny Petschel. After her son Otto married, his wife died after giving birth to their first child, a son. The parents of the wife, Otto’s in-laws, took the baby into their family and cared for it. This meant Otto could not see his son as often as he would have liked. Granny Petschel wanted to raise the baby herself, but the families could not agree to this arrangement. Granny raised the child until Otto married again. Later when the child was about eight years old Granny took him in again. In 1903 Maria and August moved into their new home. It was built with pug on the inside and weatherboards on the outside. They called it ‘Ebenezer Villa’ after Maria’s first home in South Australia. Maria developed a nice vegetable garden but the caterpillars destroyed it, especially the cabbages. “The whole garden round the house was heaving with caterpillars like a big ants nest.” (Amalia. Letter 15.11.1903). Gustav married Alwine … in 1904 ?…and they lived quite near his parents August and Maria at Katyil. Their son August Edward Petschel died on 19th July 1903, aged 30 years and six months. In 1938 Otto married a second time, to Lilian May Brewer. Granny’s daughter Amalia was a prolific letter writer, and kept in close touch with Granny’s stepbrothers and sisters in South Australia. From a reference in a letter by Amalia it seems Granny had been over to South Australia to visit the relatives in 1904. On some of her visits to South Australia Granny would also call on her cousins at Melrose (Children of her Uncle Peter Zwar) as she made her way north to Quorn to visit her sister Christiane Schnell. In 1904 Dr Bernard Zwar, Granny’s youngest stepbrother made a stop in Dimboola on his way home from a trip to Queensland. Bernard was the youngest of her stepbrothers and was born in South Australia seven years after Granny married and moved to Victoria. At the graveside at Wail, during the funeral service a stumpy tail blue tongue lizard was crawling up to the edge of the grave and looked as though it might fall in. Otto Gaulke politely bent down, picked it up by the tail and neatly flicked it back behind him without looking where it was going. It landed on the ample bosom of Mrs George Nettlebeck, and she nearly fainted in fright. (She bent forward and the lizard fell off). Maria grieved deeply for her husband. The death of August had come without warning. Gus and Alwine Petschel moved in with Maria for about 12 months before moving back to their own house only a few chains away. Maria then stayed in her house until a few days before her death. “The daughter and daughters-in-law took turns looking after Granny – four months at a time.” [Clara Petschel nee Starick].